A dental bridge literally bridges the space created by one or two missing teeth. It is a common, time-tested, and low-risk option for you when you’ve already lost your pearly whites. A typical bridge is made up of two or more dental crowns, called abutment teeth, and a false tooth in between, called pontics. The false tooth may be made from different materials, including gold and silver amalgam, but the most common is porcelain for aesthetic purposes. Why Opt For Dental Bridges? – Preclude remaining teeth from drifting out of position. – Foster confidence by restoring your smile. – Restore the ability to chew and speak accordingly. – Preserve the shape of your face. Basically, anyone with one or two missing teeth can be eligible for a dental bridge procedure. However, your dentist will make sure that the surrounding teeth are structurally sound and free from damage before starting any oral procedure. In addition, your dentist will also treat first any unchecked gum diseases before placing the bridge. 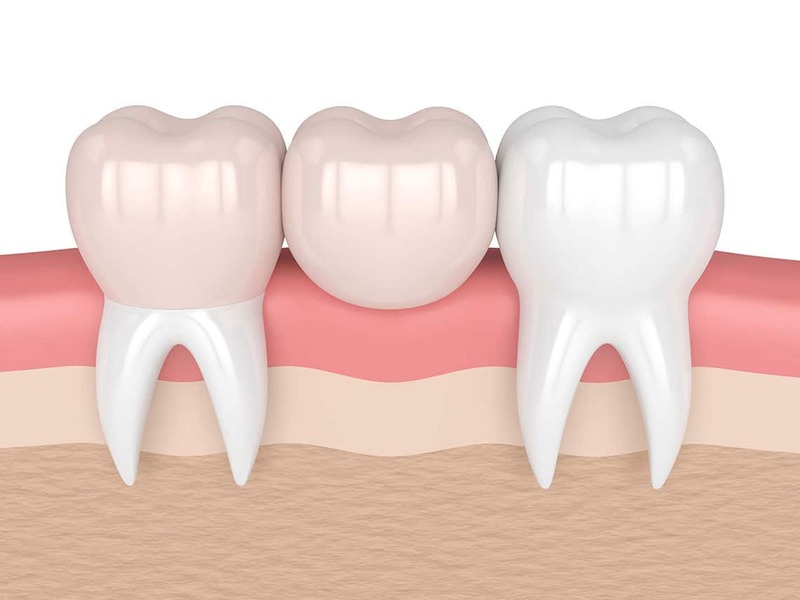 What are the types of dental bridges? Your cosmetic dentist will thoroughly explain to you the three main types of dental bridges to choose from. Traditional bridges. This is the most common type of bridge and usually made of either porcelain or ceramics. It involves creating a crown for the tooth or embed on either side of the missing tooth, placing a pontic in between. Resin-bonded bridges. This type is also known as Maryland bonded bridges or Maryland bridge. It is made of plastic teeth and gums supported by a metal or a framework of porcelain, porcelain or metal fused with porcelain. Your existing teeth are bonded with metal or porcelain wings oftentimes on just one side of the bridge. Cantilever bridges. This type of dental bridge is commonly used when there are adjacent teeth on only one side of your lost tooth. What To Expect In Your Dental Bridges Procedure? First visit. Your dentist will prepare your abutment teeth. These involve recontouring the teeth by removing a fragment of enamel to accommodate a crown over them. Impressions of the teeth will serve as a model from which the pontic, crowns and the bridge will be made in the dental laboratory. Your dental professional will then make a temporary bridge to wear as protection to the exposed teeth and gums whilst the bridge is being prepared. Second visit. Your dental professional will now remove the temporary bridge and the new porcelain or metal bridge will be adjusted and checked, as needed, to bring about a proper fit. Multiple visits may be advised afterwards, to check the fit and bite of the metal framework. The number of your dental visits will depend on the number of dental bridges. After a couple of weeks, your dentist will now cement the bridge into place. Typically, a dental bridge can range in cost from $500 to $1,200 per artificial tooth depending on the material of the bridge. Quite a large sum but your dental bridge may last for fifteen years or longer, so expect long-term savings for you. Check with your specific dental insurance company if dental bridges are covered. Unlike dentures, which you have to take off and clean, a dental bridge is permanent which only your dentist may remove. Get in touch with us and schedule your dental bridges procedure with the best dentists in Sydney.